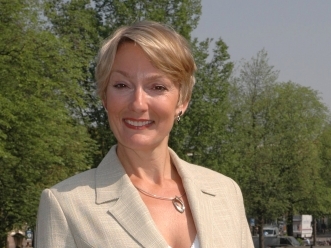 Christa Meindersma has been director of the Prince Claus Fund since 2011. She is an international lawyer with extensive experience in Asia, Africa and Europe and a passion for art and culture. Previously, Christa worked as deputy coordinator of the Task Force Sudan of the Dutch Ministry of Foreign Affairs and negotiator and senior political advisor for the United Nations, in East-Timor, Indonesia, Nigeria, Cameroon, Kosovo, Darfur, Nepal, DR Congo, Sudan and New York. Christa is member of the Advisory Council of the Prince Claus Conservatory and School of Performing Arts. The Prince Claus Fund initiates and supports activities in the field of culture and development and works in cooperation with individuals and organisations, mainly in Africa, Asia, Latin America and the Caribbean and is a platform for intercultural exchange. At the 6th World Summit on Arts and Culture in Santiago de Chile on 13-16 January 2014 Christa was a panellist of the session “Cultural heritage at risk: protection and reconstruction post-disaster” where she gave examples of successful interventions and described some of the challenges her organisation faces on a daily basis. In an interview during the World Summit she shared details about her work in Asia as part of the Cultural Emergency Response Programme (CER). The programme, which was founded in 2003, provides quick help to evacuate, stabilise or rescue cultural heritage under imminent threat of destruction or damaged by man-made disasters, natural disasters or conflict. The programme has now been running for more than 10 years with emergency interventions in 54 countries. Can you tell us about the places where the Prince Claus Fund has been active in Asia? How is your work in Asia different to your initiatives in other parts of the world? So you mainly work with saving and restoring built heritage? Do you see any specific mentality in Asia towards saving or not saving heritage, for instance traditional or colonial buildings or heritage? What more lies behind the will to save or not save an affected structure? “Situations are very different but in the discussion about saving or demolishing, replacing buildings by concrete buildings, the value or price of the land can also be a crucial factor; but also concepts about modernity and concepts about what is the value of the traditional. In some communities, for example in Sikkim - in the Northeast of India, after the earthquake, a lot of buildings were torn down immediately and replaced by concrete structures, even with concrete temples placed on top of old structures. With this in mind it would make sense to work on awareness campaigns in regions prone to natural disasters before the disaster actually strikes? Who are your partners in Asia? Can you identify any main challenges despite the diversity of projects you are working on? And a last question - are there any other organisations that lead on similar programmes?